Katherine is a graduate of the University of the Arts in Philadelphia, PA. As an aerialist she has received her training from C5, On the Fly Pros, Royal Caribbean International, and various circus artists during her time living and performing in Las Vegas. She has toured nationally and internationally as a dancer and aerialist. She has lived and worked in various cities including but not limited to; Philadelphia, Baltimore, New York City, Miami, Los Angeles, and Las Vegas. Katherine has an extensive background in dance performance as well as in event and convention work nationwide. In Vegas she performed in the Blue Man Group as their first female character, the Showbot (created by Show Creators Inc.) at the Monte Carlo Casino. Katherine has spent the last four years performing for Royal Caribbean International, where she got to travel and see the world. As an instructor and choreographer, Katherine has taught workshops and classes in dance and aerial both nationally and internationally for various universities and other institutions. Katherine is certified in both classical Hatha Yoga through the Sivananda Vedanta Yoga School and in Group Fitness through ACE. 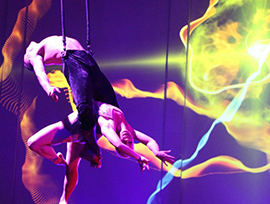 Katherine is currently working as an aerial trainer and show installer for Royal Caribbean Productions as well as an aerialist for Australia’s Strange Fruit international touring and repertory company. She specializes in lyra, two point harness, hand to hand, bungees, sway pole and various specialty apparatus.